The hallmark of doctoral training is original research. The doctoral phase was however also defined as the "third cycle" in the context of the European Higher Education Area (Berlin Communiqué ), extending higher education beyond the first (bachelor) and second (master) cycle. The "third cycle" concept implies "structured doctoral training", ie. doctoral projects are embedded within research training groups or similar peer groups. The University of Würzburg was a trend setter regarding structured doctoral training in Germany. In 2003 it started faculty spanning programs in biology and medicine. Since then, the concept of Graduate Schools run by several faculties was extended throughout the university. 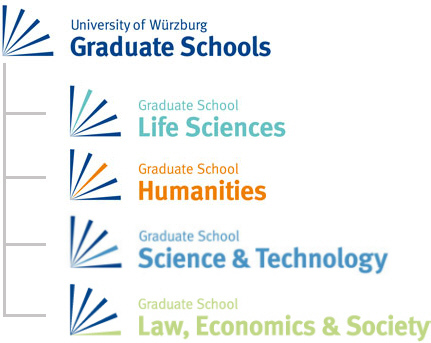 Four self-governed Graduate Schools, covering the entire research landscape at the University, are operating under the roof of the University of Würzburg Graduate Schools (UWGS). The holding has the status of a Central Scientific Institution (“Zentrale Wissenschaftliche Einrichtung”) of the University. It sets and controls general standards, develops regulations for the operation of all Graduate Schools and safeguards a coordinated development. At the same time, the UWGS assumes operative functions concerning all Graduate Schools.